Did the Flu Take Down the Packers & the Steelers in the NFL Playoffs? In the final weeks of NFL play, as the Green Bay Packers competed against the Atlanta Falcons and the Pittsburgh Steelers took on the New England Patriots, rumors circulated that several NFL players may have had the flu. Some sources say the players had fallen ill with a “flu-like bug”, though it’s unclear what that’s supposed to mean. It seems likely that a doctor’s exam, along with a flu test, could confirm, with relative certainty, whether these players were in fact suffering from influenza. Some sources reported that the players have had the “stomach flu”, which is confusing since there is really no such thing as a “stomach flu“. With flu, some people may have vomiting and diarrhea, though this is more common in children than adults. It is much more likely that these symptoms alone suggest gastrointestinal issues that are often referred to as stomach bugs, which again, should not be confused with influenza. Then there’s the reference to the “24-hour flu” in a report from ESPN Staff Writer, Jeremy Fowler. 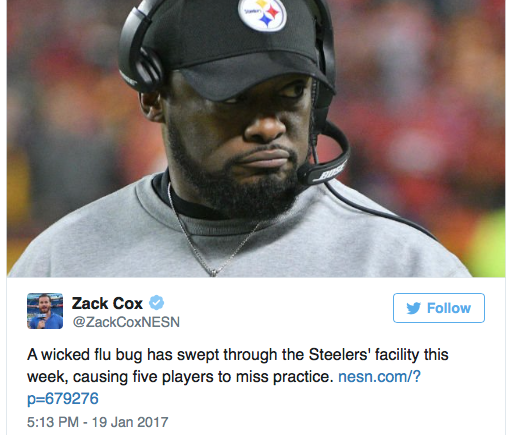 The article leads with a statement that up to 15 people in the Pittsburgh Steelers facility suffered a setback from a “24-hour flu bug”. To clarify, the flu is never a 24 hour ordeal. Rather, the flu can last as long as 5-10 days. I’m guessing Casserly doesn’t know much about the flu. He has probably never had it himself or he wouldn’t suggest that players could play well while suffering with it. This varied media coverage of these high-profile athletes and their suspected illnesses is just another example of how the public continues to be misinformed about the flu. The flu is a serious illness, that kills and hospitalizes thousands of people in the U.S. each year. Yet the majority of people I talk to, day after day, are unfamiliar with flu symptoms and the dangers of flu. I’m confident that after her son’s experience with the flu, my friend will get herself and her kids vaccinated. What I worry about are those people who haven’t had a personal experience to open their eyes to the dangers of flu. In listening to the media’s reports of flu among NFL players this week, it’s easy to think that flu is simply an inconvenience and something that is quick to overcome. This couldn’t be further from the truth. While Smith’s off-handed remarks are clearly made in jest, he makes the point that the flu would most certainly keep players off the field, and he suggests that if they’re out practicing and giving interviews than it’s likely that they didn’t have the flu at all. If these players did not have flu, it would be best if references to their illness did not include suggestions of “flu bug”, “24 hour flu” or “stomach flu” since these terms only contribute to the misinformation that keeps people from recognizing real flu symptoms. If these players did have flu, it is a reminder that everyone is susceptible to flu. Even healthy and seemingly invincible NFL players. It would seem wise that everyone – especially professional athletes that play some of their most important games of the year in the midst of flu season – get vaccinated each year. The Families Fighting Flu‘s Stay in the Game campaign emphasizes the need for flu vaccine to protect us all, even those of us who may consider ourselves young and healthy. The families that make up the organization have all had a personal connection with flu, resulting in the hospitalization or death of a loved one. They now know the dangers of flu and their message is one of action. So take their warnings seriously. Don’t wait until you are downed by the flu. As influenza continues to peak across the nation, there’s still value in getting yourself and your family vaccinated. You’ll not only be helping to protect yourself, but you can help protect others who are vulnerable to flu complications such as pregnant women, the elderly and young infants and children. If you do suspect you have the flu, get to your doctor right away. There is no cure for the flu. While the viral infection must run it’s course, if a diagnosis can be confirmed within 48 hours of the onset of symptoms, your doctor may prescribe an antiviral which can lessen the severity of symptoms and help get you back on your feet faster. To learn more about influenza vaccinate every stage of life; whether you are an adult, a pregnant woman expecting a child, or whether you have a young child, preteen or teen in your household, visit our Vaccinate Your Family website. You can also use the HealthMap Vaccine Finder to identify a place where you can get a flu vaccine in your local area.